It all started on a lark! 4 years ago on the 28th day of April’07, Tagged along like a Caddy with my roommate on a lazy Sunday morning for “just a kickboxing place to lose weight” and today a transformed me realizes I am the Driver of my life with JKD & my Teacher being the GPS & Navigator of my life’s vehicle. I walked in to the JKD India academy at a junction of life when I was surely but slowly standing at the crossroads of my own value system – for the first time immersed in self doubt about the relevance of the correctness of integrity based decisions. I initially enrolled into Mixed Martial Arts, completely oblivious to JKD & its concepts – just happening to hear bits & pieces of it in the group discussions. And there in lies the beauty of this academy – every student is in on his own journey of self discovery & realization of the Martial Arts & philosophy of life – no mass community kicking & punching routines like in traditional martial arts classes. Subsequently I did evolve into JKD and how! I am, for the world, a single girl Engineer-MBA- Marketing Professional working her way through career and life in Mumbai, with her family based in another city. So for a migrant to this detached yet spirited city, on a day-to-day basis, my friends, people I interact with, the situations and my own spirit become a very focal point of the “evolving thought and action” process. A lot of time is lost in this city in its travel, career and materialistic pursuits – and with that as the skeletal definition, though all of us intend to exercise right health, right actions and right thoughts – a lot is still left behind asking to be fulfilled. The intention is always there – but more often than not exhaustion and lack of time are cited as getaway excuses. I was no different – yet another crazy-scheduled, dedicated, hardworking workaholic, that used to be very multi talented at one time but had now reduced to a mere excel sheet & graphs expert doling out analysis reports & projects week after week, with a weekend get together thrown in here & a lunch thrown in there. In this process, I lost more than just my health and my youthful body. Yes I still did do my salsa certifications and short trips & vacations, I still remained the “spirited- awake-alive-radical-thinker”, but somewhere down the line I was aware that there wasn’t too much intelligence being applied in my decisions, there wasn’t satisfaction at the bottom of it all- which only led to further complications – so in totality all I was doing was, was getting into messy situations and further worsening it and then trying to find my way out of that maze. One such striking example is the mess I got into at my workplace – I had thwarted a senior, HOD’s sexual advances in a rather straight forward manner – little did I know of the backlash that was in store for me for the next 2 years – my appraisals were bad, promotions were cut, my profiles reduced, I was made to report to mentally unhealthy puppet people, I was almost being transferred, not to mention that the entire system we were in, backed & supported him over me, at all times. I suffered extended periods of stress, self doubt, demoralization and loss of health that came with it. All the 17 kgs that I had lost up until my 1st degree Black belt exam – I put it on all back and more. And though I knew, I was not fighting back, despite my Teacher behind me, I fooled myself into rationalizing that the “hurdle of combating the individual & the system” was way too laborious and something I dint want to get into. I did eventually fight it out and the man in question is out of the system now and the incident and its investigations turned into a high profile case with coverage in the media et.all. Yet today, when I sit back & ponder, after having finished & emerged victor of that battle, I realize were it not for the principles of JKD & Bushido – I would not have won and would have felt like a demoralized guinea pig for the rest of my life. This battle has been THE MOST defining moment of my life, the ultimate exam of my core, my beliefs, value system, courage and practically everything in me. It was only my Teacher and JKD that sailed me through. Every one of the principles of JKD – “Simple, Direct, Effective, Fluidity, Non Conditional, Open Minded and Non Traditional”, the Bushido Samurai warrior code of “Courage, Spirit (Benevolence), Truth (righteousness), Honor and Duty” and Principle of Buddhism- “Detach from desire & fear and you will undoubtedly win” were aptly applied in every twist & turn of the case. During combat, the individual was separated from the system and the system trappings of non cooperation were handled by the “directness” of writing to the Chairman himself, asking him to intervene and deliver justice. The investigating committee saw in me and my statements, truth, honor, integrity and ultimately ruled in favor of the side of truth. We had options of publicly embarrassing him, going to the cops, filing a legal suit against him & the company, seeking huge compensations and entirely finishing the individual, but the benevolence bred into us prevented in indulging in such acts, even at the height of disastrous calamity. Our integrity and the benevolence of “a warrior that kills is the same warrior that exhibits compassion” just let him be. Today, not just this battle, but in every aspect of my life JKD holds the strings – be it in my health habits, in my adapting a vegetarian lifestyle, in my finally overcoming the fear of swimming and snakes, in my relationships, in my situation-handling abilities, in my career, in my life and especially in my martial arts – each one of these is guided by the simple question “How would a JKD man do this?” and the answer obtained, thus implemented. 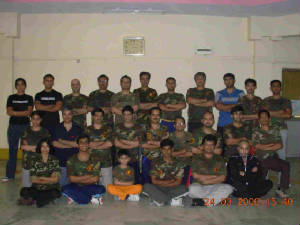 Its 4 years, and till date, every single day I have not ceased to realize that a simple straight Lead punch , the same Side kick has so much to it than just meets the eye – every punch is a new learning, every kick a new perspective and every throw a shaking of complacency, beyond the arena of the martial arts. 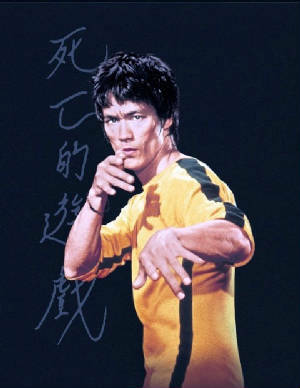 Bruce Lee and my Teacher always say -“Life only demands of you the strength that you possess” – I stand testimony to this. As I stand certified a 2nd degree Black belt, I realize the path has been worked really hard for, been fought with the tears, blood and sweat and every centimeter of those 2 stripes on my Belt has been truly deserving. Today I walk chest high, proud of me and the honorable life lessons that I learned & lead but I remain and will remain the most surprised and the most mystified student of the “Way of the Intercepting Fist” and I am not going to change that, coz I have come to realize, that as long as I am curious, I will explore, prod, question, doubt, fight and finally implement the right thought, decision and action. I still can’t figure out the exact moment, date & time JKD crept into my being and completely changed it all – But it just did. That Sunday Lark surprisingly came with the entire SPARK in it! That Sunday morning’s lark was so worth it. The journey continues….. to the Third stripe of Martial arts and Life and beyond..